How to add Skype buttons in your website? What is a Skype button? Add a Skype button to your websites and let people get in touch with just the click of a button. Whether they’re on a computer or mobile, they will get through with a voice call or an instant message. Step 1 : Open a below link. this link is made by officially Skype Devloper. Then after select the check box if you want only chat then checked it out or else only call then checked it out or both. Then after select the button color and size. Step 3 : Now you can see the some code in below text area , Just copy and paste in your site . 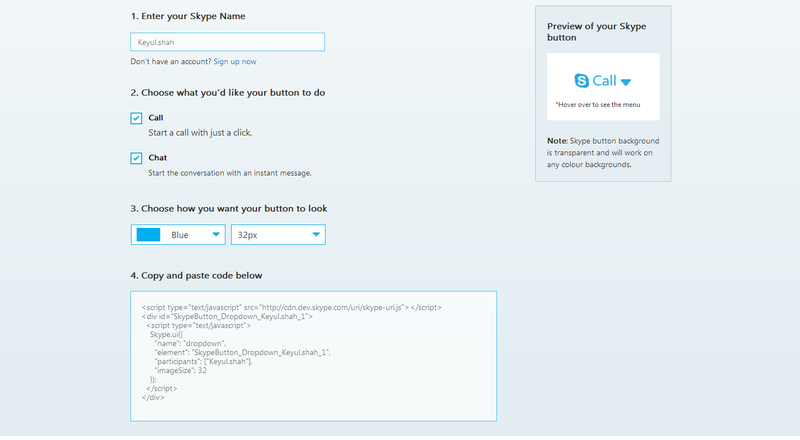 Step 4 : Enjoy the skype calling or chat in your website.